Camlough (/kæmˈlɒx/ kam-LOKH; from Irish: Camloch, meaning "crooked lake") is a small village in County Armagh, Northern Ireland. The village of Camlough ('Crooked Lake') is so called from the shape of the lake, known as Cam Lough, in the parish, which is about 90 acres in extent. It is located five kilometres west of Newry. Land to the south-east of Camlough rises steeply to Camlough Mountain within the Ring of Gullion. There is much evidence of pre-Christian settlers in and around the village: the erection of Dolmens on Camlough Mountain, The Hag's Chair in Lislea and the Ballykeel Dolmen which all point towards Stone Age dwellers. Camlough (Irish: Camloch) was an ecclesiastical district in the Barony of Upper Orior and was anciently part of the O'Hanlon's country. At the time of the Plantation of Ulster, 1000 acres of 12 townlands were granted to Henry McShane O'Neill and the village was developed during this period. Camlough village is in the townland of Cross, referring not to a stone monument but to the village crossroads in the north of the townland. In 1620 Camlough Mountain was known as Sliabh na Croise, meaning 'Mountain of the Cross'. Camlough National School was built in 1836 and was located on the Quarter Road. It was divided into a boys' school and a girls' school. The classroom was heated by a pot-bellied stove in the centre of the room and pupils would have been sent to collect sticks for the fire. A Mass Rock (Carraig an Aifrinn), dating from the Penal era, is located in Camlough. It is situated in Grant's Rocks and is over 300 years old. In 2003, a special Mass was held at the Mass Rock in memory of the people who suffered during Penal times. St Malachy's Church, Carrickcruppen, is the oldest church building in the Parish of Lower Killeavy. It was built in 1816 and replaced an earlier church. Camlough River is a small meandering stream that makes its way from Camlough to the Newry Canal. It was once a vibrant fast flowing river, teeming with trout and the power source of approximately nine mills. The first of these mills was Kelly's Flax and Scutching Mill in Camlough village. It was situated to the rear of Carragher's house. Established around the mid-18th century, the mill comprised nine buildings, two of which were split level. It was powered by water from two ponds on either side of the Keggal Road. The Camlough Volunteer Company was part of the Newry Brigade, which was formed in the winter of 1918-19 to direct activities in South Down and South Armagh and continued to do this until the formation of the Forth Northern Division in March 1921. During the Irish War of Independence, plans were put in place in the autumn of 1920 for an attack on Camlough RIC Barracks. In December 1920, Frank Aiken led an abortive Camlough Volunteers assault on the Royal Irish Constabulary station in Camlough. In reprisal, the newly formed Ulster Special Constabulary burned Aiken's home and those of ten of his relatives in the area. In addition to Aiken’s home being burned, the military burned many other houses and premises in Camlough as well as the Sinn Féin hall in Newry. Camlough is situated in South Armagh, which was the most militarised region in Western Europe during the Troubles. 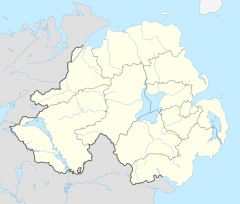 The region was a stronghold of support for the Provisional IRA, earning it the nickname 'Bandit Country' (see Provisional IRA South Armagh Brigade). On 19 May 1981, five British soldiers were killed in an Irish Republican Army (IRA) landmine attack on the Chancellors Road 3 miles from Camlough. The soldiers had been travelling in a Saracen armoured personnel carrier when the bomb exploded. This attack was during the 1981 Irish hunger strike in Maze (HM Prison), and 3 miles from the home of one of the hunger strikers, Raymond McCreesh. A Guinness World Record for the longest open water relay swim was broken by a team of intrepid swimmers at Camlough Lake (also known as Cam Lough) in South Armagh on Saturday 19 September 2009. The group beat the world record for a 'continuous long distance relay swim' after embarking on the world beating attempt over a week before. Two hundred swimmers from across Ireland took part in the challenge. The previous record was 480 km; Camlough set the record at 680 km. Ballykeel Dolmen and Cairn are south west of Camlough, at the western foot of Slieve Gullion. The dolmen is an example of a portal dolmen and is made up of two portal stones with a sill between, and a lower backstone supporting a huge capstone. Crooked Lake Triathlon is an annual triathlon held in Camlough in June. Open Water / Marathon Swimming Since breaking the Open Water Relay Guinness World Record the lake has been a prominent training ground for Triathletes and Open Water Swimmers. Local Swimmer and CLWF Chairman Padraig Mallon then went on to complete the English and North Channel in the same year (only 3rd person to ever do so). His sister Colleen Mallon went on to break the Irish record for crossing the North Channel in 2014 and Keith Garry completed the English Channel in 2014. The area has also produced 2 successful relay teams crossing the North Channel and world-class ice swimmers. Camlough Rovers F.C. is the local football team, playing in the Mid-Ulster Football League. Camloch is famous for its links with the Gaelic Athletic Association (GAA). The village hosts two Gaelic football clubs. St Patrick's Carrickcruppen GFC has won four Senior county championships; Shane O'Neill's GAC, a continuation of the first Camloch club (William O'Brien's, founded in 1888), has won two Senior and three Junior titles. Craobh Rua Camloch hurling club was established in 1991 in the Camlough and Bessbrook areas of South Armagh. As hurling had not been played in the area in some 40 years, the club received some help from Armagh Hurling Board chairman, Jimmy Carlisle, who helped set up coaching courses for the children and their mentors. Over its first ten years the club has successfully fielded teams at under 12, under 14, under 16 and since 2010 at under 8, minor and senior levels. They play their home games at Dunster Park (An Dún Rua) on High Street, Derrymore. In 2010 the Seniors reached the Junior Championship Final and subsequently made it to the semi-final of the Ulster championship. The Under 14s won the 2010 Championship and the Feile, and represented County Armagh in the All Ireland Feile in Ennis, where they reached the semi-final. There are currently three Craobh Rua players representing Armagh at senior inter-county level, Fiachra Bradley, Micheal Garvey and Ryan Lewis. 0.0% were from an ethnic group other than white. Tomás Cardinal Ó Fiaich, Irish Catholic Cardinal, Archbishop of Armagh and the Primate of All Ireland. Raymond McCreesh, member of the Provisional IRA who died on hunger-strike in 1981. Paddy Quinn, member of the Provisional IRA who took part in the 1981 Irish hunger strike. ^ "Longest distance swimming in relay (open water)". Guinness World Records. Retrieved 2015-06-19. ^ "Archaeological Sites of Counties Armagh and Down" (PDF). Northern Ireland Archaeology Forum. Retrieved 2010-11-17.